You can also get additional information on your ORCA purchase by calling (310)-532-4116. Copyright © 2006 RB Racing-RSR All rights reserved. Contact RB Racing for more information. Normally aspirated or Turbocharged, RSR Fuel Injected 113/132 Cubic Inch ORCA motors are the most sophisticated and powerful 45 degree V-Twins you can buy anywhere on this planet! With a $2,200.00 to $2,500.00 RSR Fuel Injection system standard equipment these motors flow more, outpower, and just plain outdo stupid "billet" motors for $2,000.00 less! It's the airflow stupid!... to paraphrase and earlier campaign slogan! Closed Loop RSR EFI systems use a huge 56mm throttle body with special port-injected inlet manifolds. Nothing, absolutely nothing outruns a LSR Exhaust System. SA Heads require Special exhausts with four bolt flanges to mate to their enormous ports. Stock or other aftermarket exhausts do not fit SA portts. 13 variations to choose from! More horsepower than any other V-Twin in the world. Choose from several options depending on your intended useage and the horsepower you require. From 350 to 500hp. 113/126/132/139" ORCAS are designed around the high flowing, big valve Special Application SA heads. Super Port Heads (with stock port location) can be ordered for those with clearance problems that come with the SA head's raised inlet and exhaust ports. Electric compression releases insure perfect starting time after time, even with 14:1 compression ratios! No rinky-dink chain saw button releases that fail or shut too soon! These are a mandatory option for all ORCA street engines! ORCAS use lightweight forged pistons that accelerate quickly and won't overstress your motor with stratospheric loads on the small and big ends of your rods and your bearings. RSR Air Fuel Gauges provide real time visual feedback for tuning and closed-loop control. These are a mandatory option for all RSR Fuel Injected ORCA motors. Digital Dash contains two egt displays (switchable to C or F) and 3 Bar Boost Gauge. Use your existing ignition system or upgrade to a complete MSD Multi-Spark CDI System. 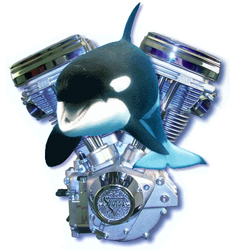 ORCAS do not tolerate low amperage "nose cone" systems , especialy for turbo operation. Some ignition systems are not compatible with our RSR Fuel Injection and some should not be used at all with ORCA motors. Call for details or "push" INFO for more on this subject. RSR Fuel Injection requires at least a 32 amp charging system. 40 amp systems are highly recommended.